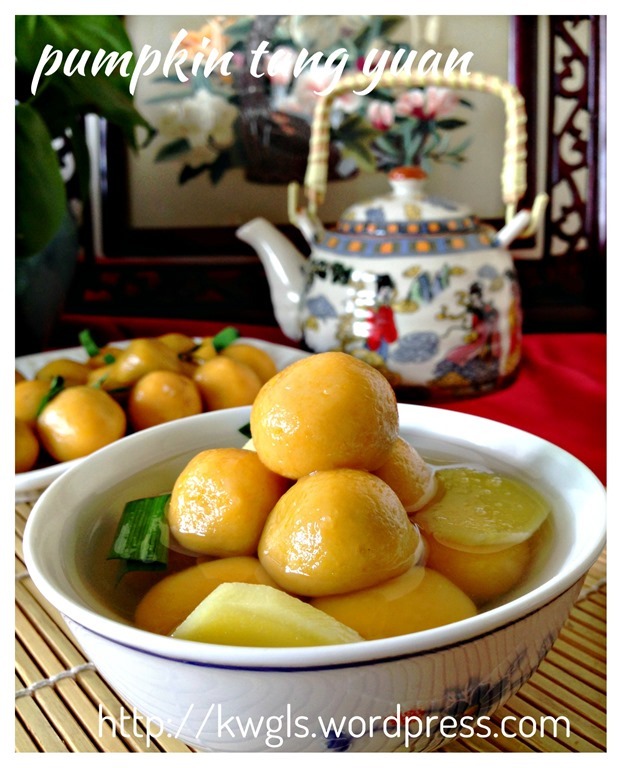 Today is 12-12-2014, and in 10 day’s time, Chinese will be celebrating the arrival of the Winter Solstice 2014 by preparing some delicious Tang Yuan or glutinous rice balls. 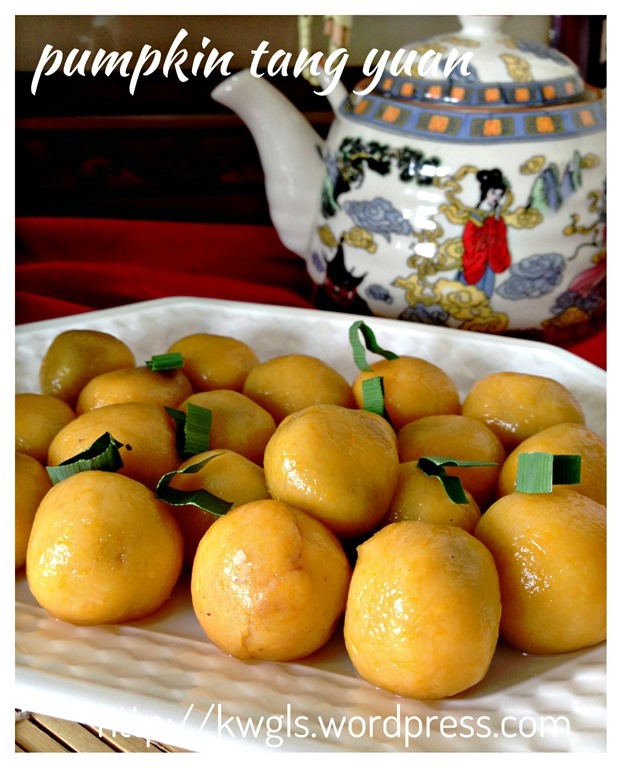 For this year, I am sharing a variation of this traditional tangyuan, pumpkin tangyuan. 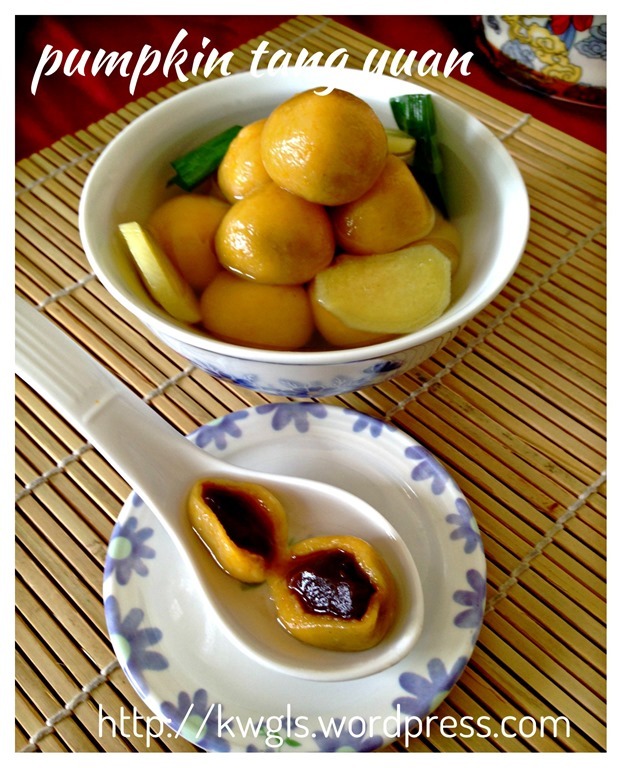 Adding pumpkin will enhance the texture, flavour and look of the tangyuan. 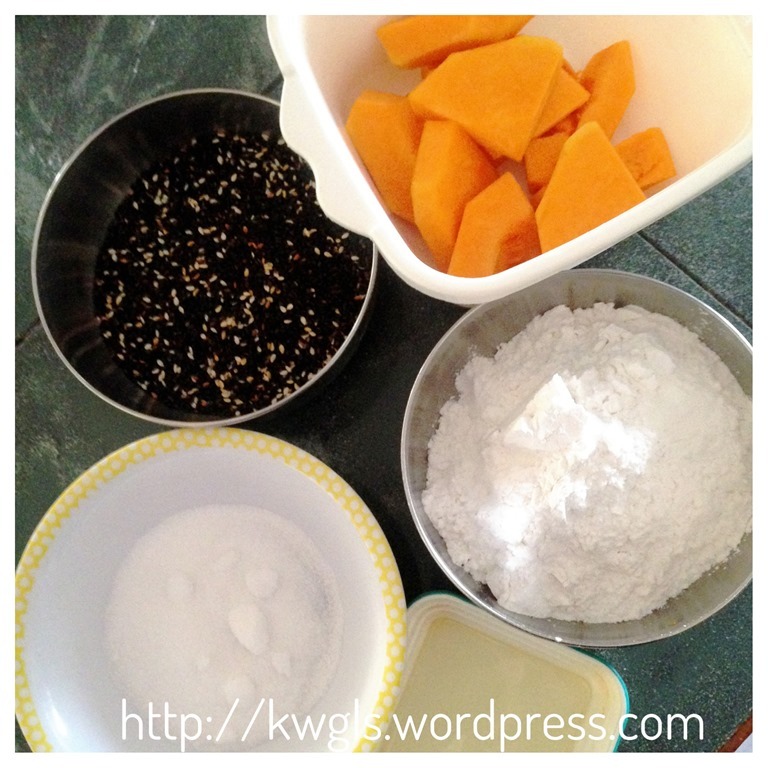 In addition, it will provide some natural sweetness for the plain dough. As for the fillings, my initial thought was to share will all the black sesame fillings. However, half way during my preparation, my food processor broke down and refuse to work.. My sesame fillings become very grainy and I have resorted to the use of the ready made red bean fillings. Hope that readers can excuse me for this. 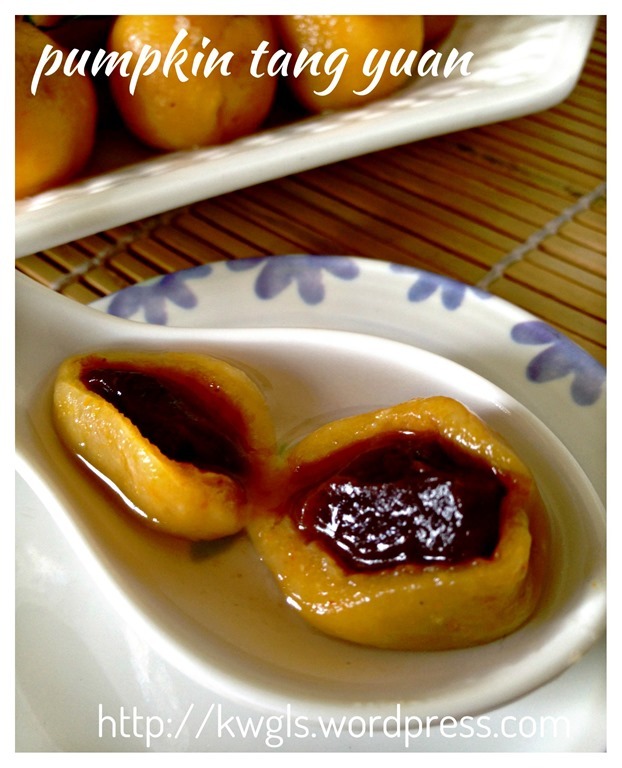 slice the pumpkin in thick pieces and put in a microwavable bowl. Microwave the pumpkin for 2-3 minutes until it is cooked and soft. You can also steamed the pumpkin for about 10-15 minutes. 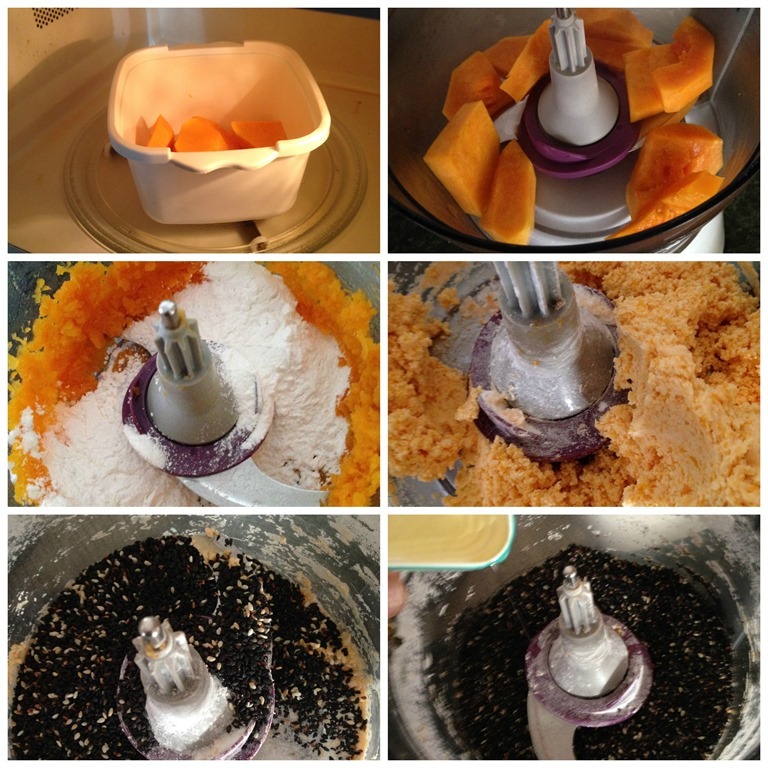 Transfer the pumpkin to the food processor. Mash until puree form, add the glutinous rice flour. Blend until it form a pliable dough. If the dough is too dry, you can add in tablespoons of water to assist the binding. 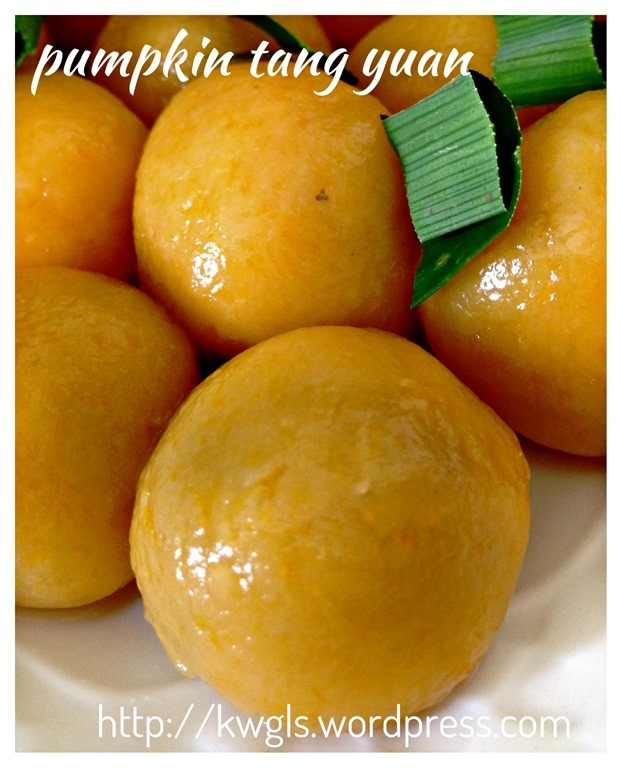 If you do not have a food processor, use fork to mash the pumpkin until puree, add the glutinous rice flour gradually and use hand to knead until a pliable dough. For the black sesame seeds fillings, blend the roasted black sesame seeds and sugar until fine and powdery. Add the cooking oil. Blend until it form a pliable dough. If it is too dry, add more cooking oil to the black sesame fillings. Take about 8 grams of fillings, shape round and set aside. Prepare the same for all the remaining. Pinch some red bean paste (about 8 grams) and shape round. Perform the same for the remaining red bean paste. Set aside. 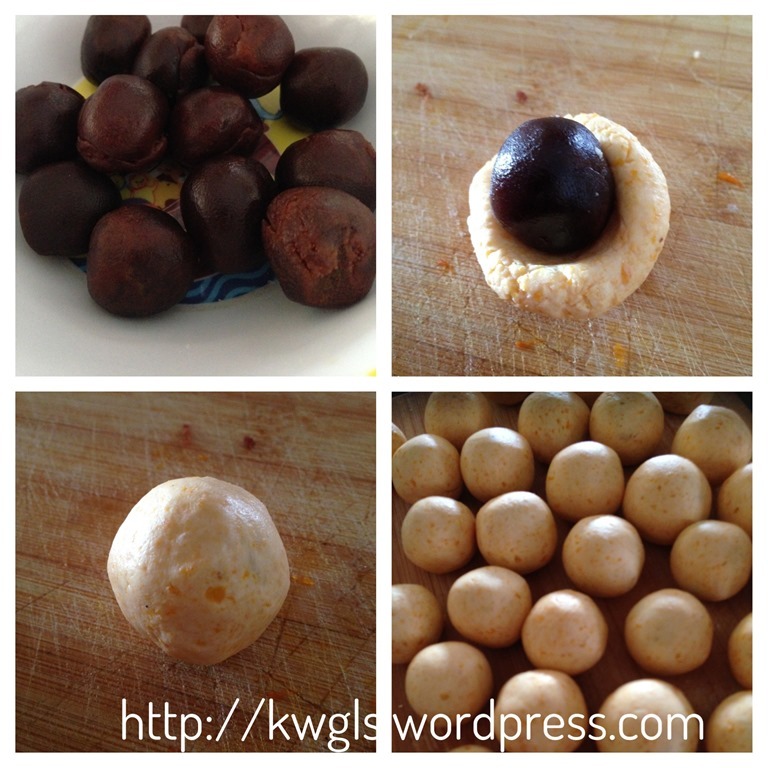 Pinch about 8-10 grams of the dough, shape round, lightly press using the thumb to form a cavity, put a red bean paste ball or black sesame seeds ball on top of the dough. Wrap the dough around the filling. Seal the sides and shape round. Bring a pot of water to boil. Meanwhile, get ready another pot of water mixed with ice. 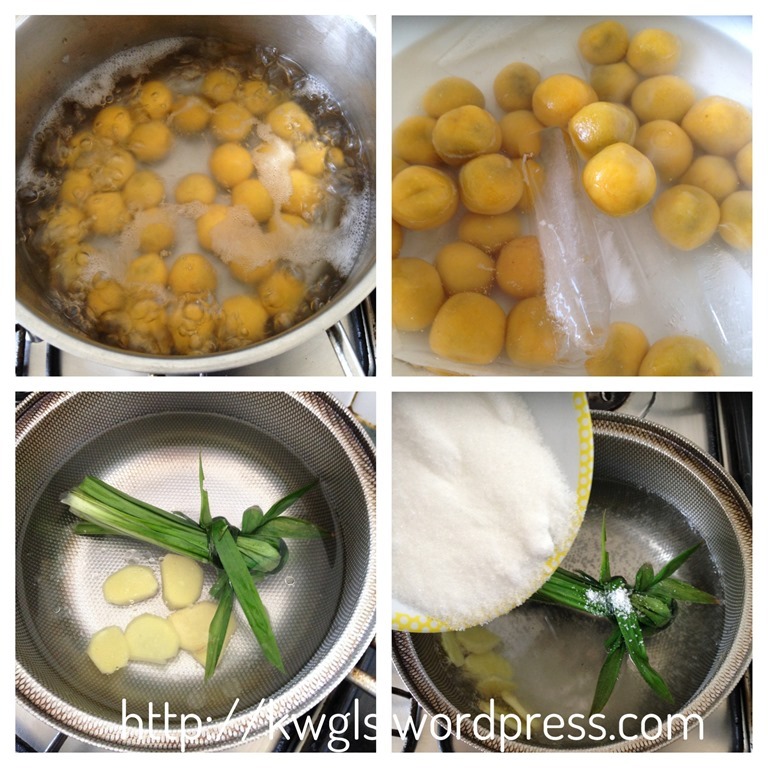 Place the tangyuan on the boiling water and boil until the tangyuan floats to the top (about 5 minutes). Drain and transfer to the icy water for 2 minutes. Drain and set aside. The main purpose of this step is to minimize the tangyuan from sticking to each other and preserve the texture of the tangyuan. 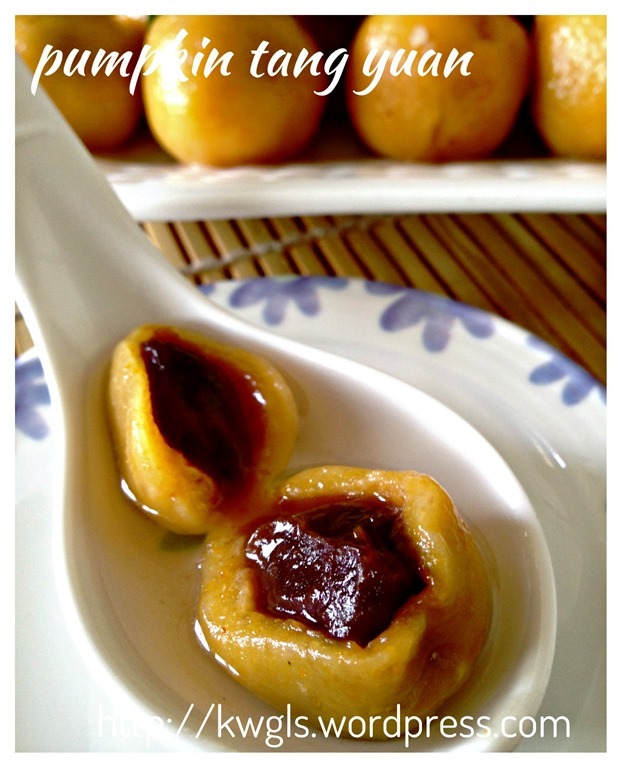 Over cooked tangyuan can be mushy and not spongy to eat. In a smaller pot, place about 1 litre of water. 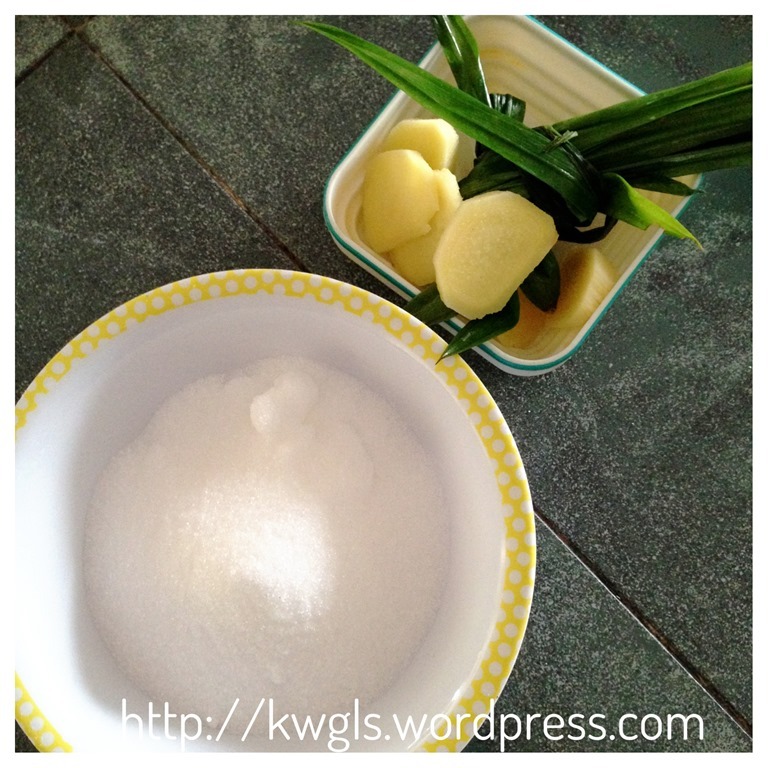 Add the Pandan leaves and sliced ginger and bring boil. Once boiling, let it continue simmering for about 5 minutes to bring out the flavour of ginger and Pandan. Add the sugar, stir until dissolved and off the heat. 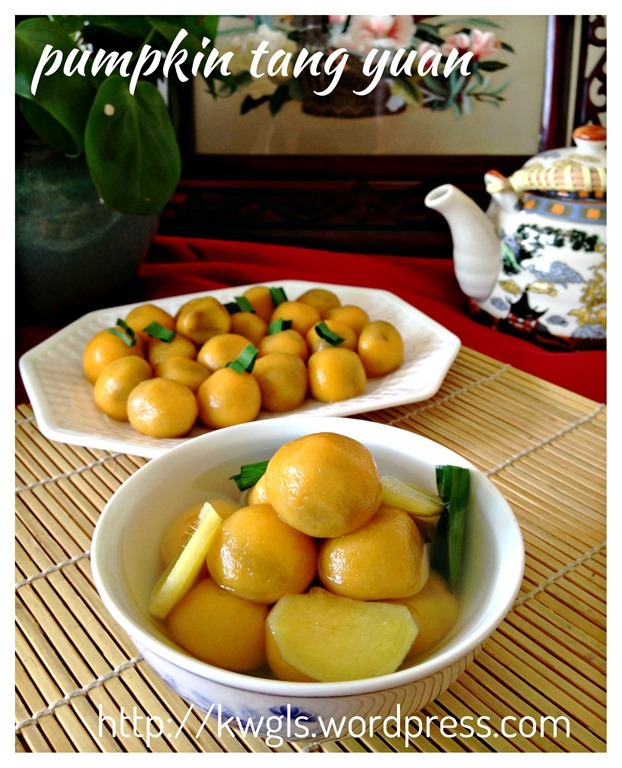 For serving, have some tangyuan in a bowl and served with hot ginger syrup. 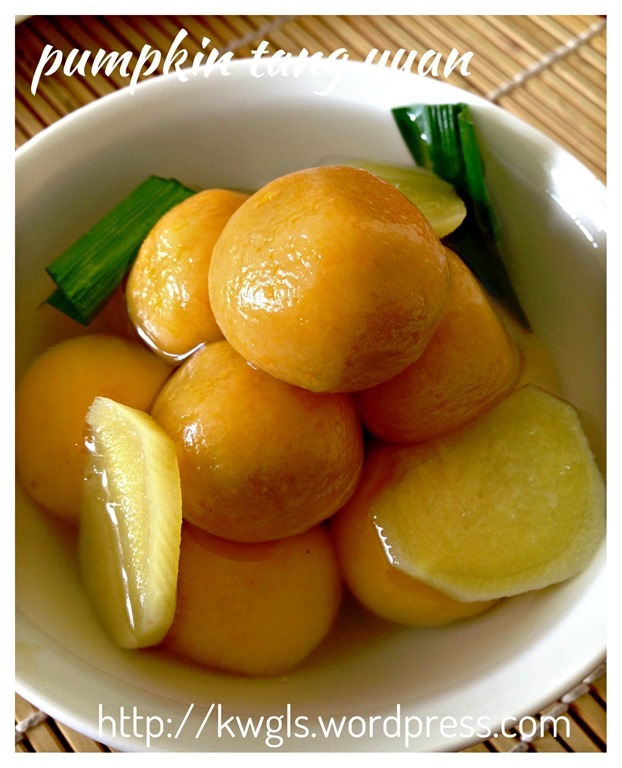 It is common for us to serve tangyuan with ginger syrup because glutinous rice have a tendency of producing intestinal gas and ginger have the ability to minimize such production. If you do not like the ginger syrup, you can add some osthmantus flower to become osthmantus syrup. Another alternative is to eat the tangyuan without syrup and rolled over some crushed peanuts and sesame seeds. 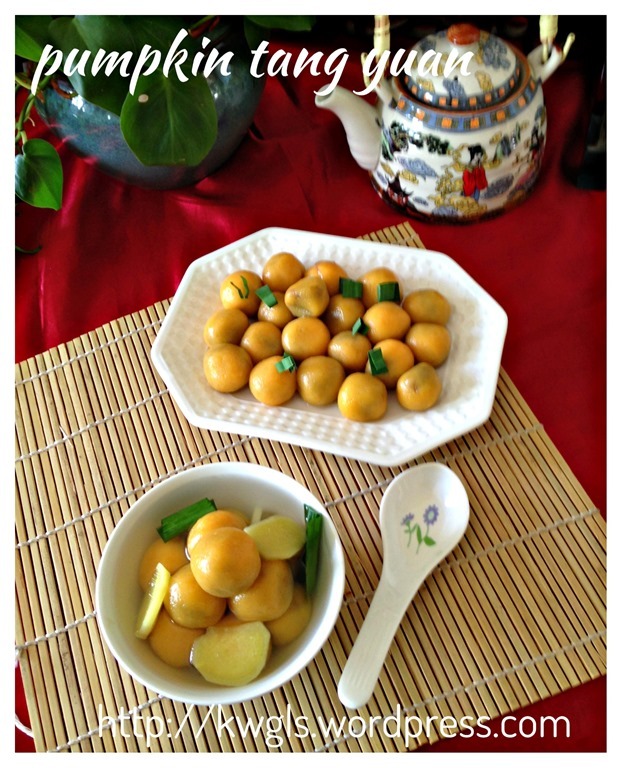 For those who wanted a change, you can try this simple tangyuan recipe for the coming winter solstice. I also take this opportunity to wish readers a happy winter solstice festival 2014. 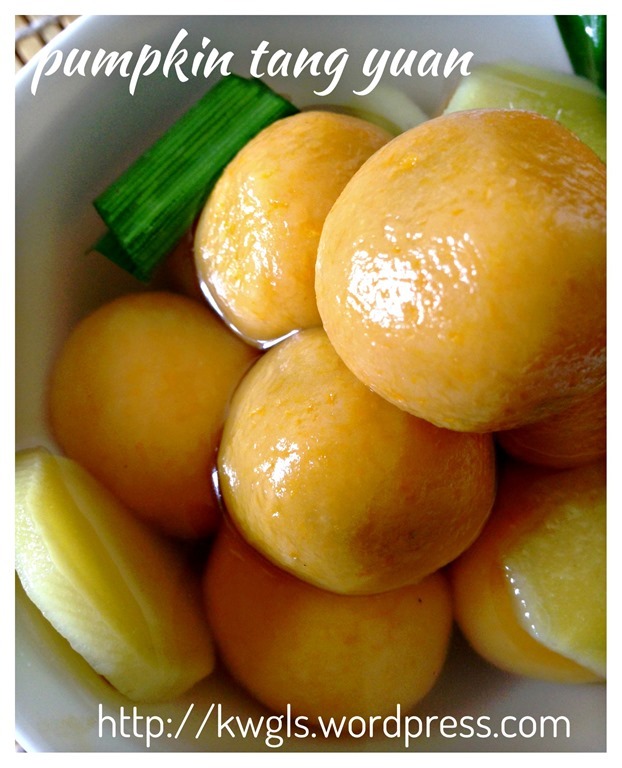 This entry was posted in Chinese and Asian Cakes and Snacks, Desserts, Food Preparation Series and tagged GUAI SHU SHU, Guaishushu, kenneth goh, tan yuan, tangyuan, winter solstice 2014, 南瓜汤圆， pumpkin Glutinous rice ball, 汤圆， 8， postaday. Bookmark the permalink. These look great! Is it possible to steam them instead of boiling? Just wondering if this will result in different texture of the tangyuan. Sorry, Kenneth, I don’t follow you. When you boil them, don’t they get heated up? The rice flour is cooked by the boiling water – how is it different from steaming? Natalie, no Chinese steam them !! We boil them !! No harm to try the way you like but if failed don’t tell people that Kenneth Goh taught you !! Ha ! Ha ! To boil, you need to cook the sticky rice flour not Rice flour as you mentioned as they are totally different flour !! The filling may not melt if you steam. Boil will be faster, once the water boiling, drop the Tangyuan into the boiling water and wait until it expanded otherwise the inner part is not cooked. Just like you cook the spaghetti , need more water so that they will not stick together. Hope you will be clear. We often put the cooked Tangyuan into the hot syrup. My sister in law said must be in the cooled syrup so that the tangyuan will not be soft. Many of my friends said that too ! Alamak, I don’t know. They cooked the syrup at night then cook the tangyuan in the morning. Only Ginger pandan syrup is nice. When my kids were studying in NZ, I thought them just use ginger as they couldn’t find Pandan leaves there. Very yummy too. I lost the recipe as I wrote in a pc of paper. Hunting high and low, thanks goodness I found it. This is the best I have eaten !